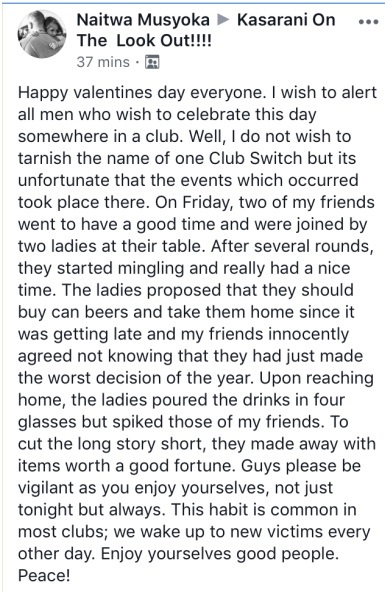 Thursday, February 14, 2019 - This guy is warning men to be on the look-out if slay queens approach them in clubs after his friends learnt it the hard way. His friends went to party at the famous Club Switch in Kasarani and two slay queens approached them and asked if they can join them for drinks. As expected, the men agreed to enjoy drinks with the ladies. After several rounds, the ladies convinced the two guys to buy several cans of beer and go home to continue with the drinking spree. The horny guys thought they had hit a jackpot but when they reached home, their drinks were spiked and valuable items stolen from their house by the cunning slay queens. Read this post and be careful with the so called slay queens. Kunywa pombe uende zako. Achana na hawa slay queens.